About CURT Manufacturing: CURT has grown to become a leading force in the towing industry, known for quality and value made trailer hitches and towing products. Curt's pride and claim to fame is the fact that their products are American-made. They are most known for their Curt Hitches and towing related accessories which has allowed them to claim 'The First Name in Towing Products’. CURT now runs out of more than 10 distribution centres, making their delivery times in the US and Canada tough to beat. CURT Manufacturing is well known for their competitive pricing and unsurpassed quality. CURT is one the leaders in the industry and that's been possible through recognizing the importance of the customer and their people. All of Curt Manufacturing's products are available from warehouses located in Canada and the USA. 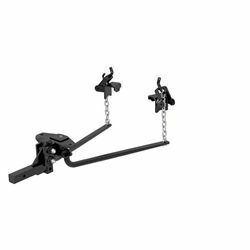 Curt has become a well-known brand, they understand the meaning of giving value to the customer, and they're able to support that by providing a quality made Curt hitch at a reasonable price. Our selection of Curt Hitches in Canada is hard to beat, with many locations accross Canada to ship from makes it real easy to ship the product quickly and free.